The legendary Roald Dahl’s book Charlie & Chocolate Factory from 1964 (and its subsequent two film adaptations from 1971 and 2005) told the story of a magical candy factory and its eccentric and mysterious owner Willy Wonka. A chocolate river, gum that is a whole turkey dinner, never-ending gobstoppers, and, of course, the singing and dancing oompa-loompas are just a few of the surprises that waited inside the doors of the famously secretive factory. Of course, in a real life candy empire, there are a lot more failures, hard work, father/son disputes, and an unfortunate lack of oompa-loompas. What follows is the tale of how the Mars candy company went from a small candy business started by a polio stricken teen to one of the largest candy companies in the world. The story of Mars candy starts in Newport, Minnesota (southeast of St. Paul) with the birth of Franklin Clarence Mars on September 23, 1883. Frank was the son of a gristmill operator (grinding grains into flour) who only moved to Minnesota from Pennsylvania with his wife, Alva, months prior to Frank’s birth. When Frank was little, he battled polio which left him disabled the rest of his life. As you might imagine from this, he was rather immobile as a kid, so he spent a lot of time watching his mother bake and cook, including watching her go through the difficult and tedious process of making fresh chocolates. He got so into candy, that he began selling Taylor’s Molasses Chips and creating his own candy recipes while still in high school. By the time, he graduated, he had a pretty successful career going selling candy wholesale to stores in the Minneapolis/St. Paul area. In 1902, he married Ethel G. Kissack, a schoolteacher. About a year later, Frank’s first son – Forrest – was born. It was also around this time that the candy market became oversaturated. With the Hershey Bar having been first introduced in 1900, the United States’ first mass produced candy bar, a host of other locally owned candy chains popped up. The competition was fierce, especially in the Minneapolis area. Brands like Chick-O-Stick, Pearson’s, and Cherry Hump started in Minnesota and all are still around today. So, it wasn’t a huge surprise when Frank’s wholesale business went under. To add a little lemon juice to his fresh wound, in 1910, Ethel divorced Frank for being unable to support her. She also won sole custody of Forest, who she promptly sent to live with her parents in Saskatchewan, Canada. The ugliness of the divorce wasn’t a good omen for Frank and Forrest’s future relationship. They would rarely see each other until years later, with tensions still running high. Frank, never a man to get too down, tried again, this time marrying another Ethel – Ethel V. Healy – and moving to Seattle, Washington to go back into the candy business. He failed again with wholesaling and creditors started taking his stuff. He moved thirty miles south to Tacoma and again struggled. In 1920, Frank and Ethel the second moved back to Minnesota to be closer to their families. At this time, Frank had only four hundred dollars to his name. But despite his constant struggles with candy, he continued to try, this time making his own at three am every morning with his wife doing the selling. The candy bar was the Mar-O-Bar, made out of chocolate, nuts and caramel. It was tough, but they started to make a little money and then a good amount more. After years of trying, Franks Mars had finally carved out a somewhat lucrative career in candy. They were even able to buy a house and would have been comfortable being local candy suppliers. But the invention of the Milky Way changed all of that. Mars Company quickly launched into orbit. They moved their headquarters to near Chicago and by 1928, just five years after introducing the Milky Way, they were making $20 million in gross revenue (about $273 million today). In 1930, they introduced the Snickers bar (named after Frank’s favorite horse) and, soon after, the Three Musketeers. In the end, Frank gave Forrest $50,000 and foreign rights to the Milky Way to basically leave his company alone and move to Europe. Fortunately for the company, that is exactly what Forrest did. While in Europe, Forrest learned from Switzerland’s Nestle chocolate company about how to make good, sweet, European-style candy. He tweaked the recipe of the Milky Way to make it more sweet. He called it the “Mars Bar.” It sold even better than the Milky Way in Europe, amassing Forrest his own considerable fortune. Frank passed away in 1934, at the young age of fifty. His wife, Ethel, took over the company, then Frank’s half-brother , William L. (Slip) Kruppenbacher when Ethel was too ill to run it. In 1945, Ethel passed away. The company moved to the next of kin, the business savvy Forrest. Forrest took over the company and immediately diversified, turning Mars into more than a candy company. He worked with a European pet food supplier and, eventually, created Whiskas Catfood. He worked with a Texas salesmen to create ready-to-make rice. That became Uncle Ben’s Rice. Besides being a brilliant money-making business man, he was known to have a violent temper and a demand for perfection. For example, he was known to throw chocolate bars out of windows if he felt they didn’t meet his quality expectations. Remarkably quickly, he turned a regional candy maker into a world-wide food empire. Today, it is his three kids who are reaping the benefits. John, Forrest Jr., and Jacqueline. They are among the richest people in the world, each owning a third of Mars, Inc, which currently employs over 75,000 people and is valued at around $70 billion, making it approximately the sixth largest privately held company in the world. In 1941, Forrest Mars Sr. struck a deal with Bruce Murrie, son of famed Hershey president William Murrie, to develop a hard shelled candy with chocolate at the center. Mars needed Hershey’s chocolate because he anticipated there would be a chocolate shortage in the pending war, which turned out to be correct. 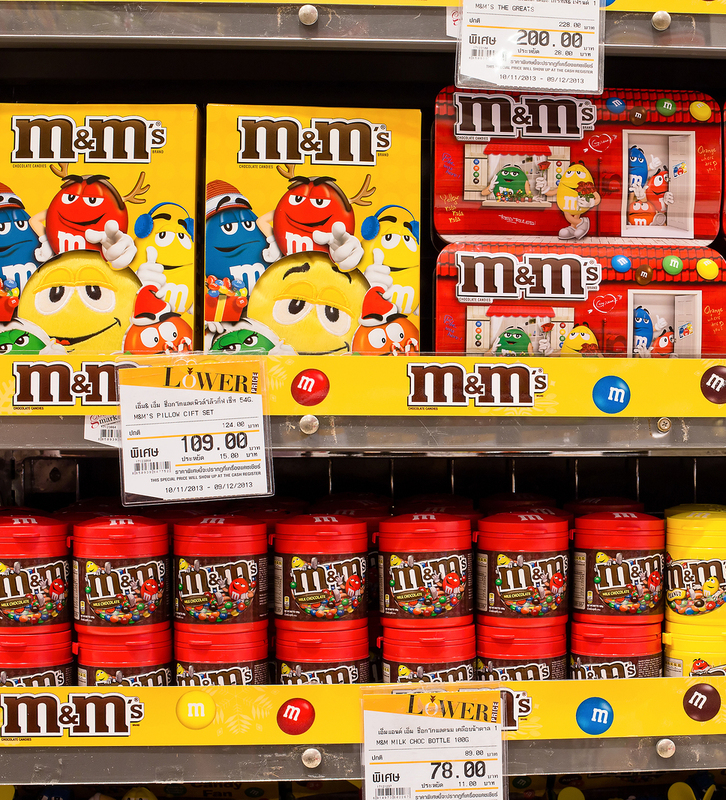 As such, the deal gave Murrie a 20% stake in the newly developed M&M; this stake was later bought out by Mars when chocolate rationing ended at the end of the war. The name of the candy thus stood for “Mars & Murrie,” the co-creators of the candy. The “M&M” was modeled after a candy Forrest Mars, Sr. encountered while in Spain during his quasi-exile from Mars in the 1930s. During the Spanish civil war there, he observed soldiers eating chocolate pellets with a hard shell of tempered chocolate. This prevented the candies from melting, which was essential when included in soldiers rations as they were. Not surprisingly, during WWII, production of M&Ms skyrocketed due to the fact that they were sold to the military and included as part of United States’ soldiers’ rations. This also worked as great marketing; when the soldiers came home, many were hooked. William Murrie, father of Bruce Murrie, was originally hired by Milton Hershey in 1896 as a salesman. In his first week on the job, he managed to over sell the plant’s production capacity. This so impressed owner Milton Hershey, that he tabbed Murrie to be the future President of Hershey; this later happened in 1908, a position he held until retiring in 1947. So how did he do? When William Murrie first took over running Hershey, the gross annual sales tallied up to about $600,000 (about $15.5 million today). Upon his retirement in 1947, he had grown the company to a gross annual sales amount of about $120 million (about $1.25 billion today); meaning over the span of those 39 years, he increased the annual sales rate at an astounding average of approximately 15% per year. In the 1920s, Murrie tried to convince Hershey that they should produce a chocolate bar with peanuts. Hershey didn’t like the idea, but let him go ahead as long as the bar wasn’t under the Hershey brand name. And so, in 1925, the “Chocolate Sales Corporation”, a fictitious company Murrie came up with, debuted the “Mr. Goodbar”, which was wildly successful. I strongly recommend you read “The Emperors of Chocolate” by Joel Brenner. It give a rather thorough overview of the founding and growth of both Mars and Hershey. One of the interesting points is Mars copied Hershey’s equipment “rivet for rivet” through the use of industrial spies. Jack london,Frank mars,Aimee semple mcpherson lived similarly and died similarly,of kidney failure.Fast and furious,they gave america a push like none else. When I was a teenager, I used to buy a gum drop candy called Drops. It is similar to Dots. I can not find it anywhere on the net. Can you help me find out if it ever exited or am I just dreaming.